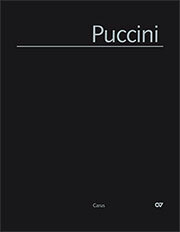 With his Capriccio sinfonico, SC 55, Giacomo Puccini completed his studies in 1883 at the Milan Conservatory. It is the most extensive of his three orchestral works and also his last. Apart from occasional smaller works, thereafter he dedicated himself only to opera. 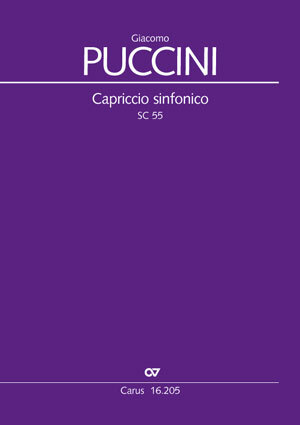 Nonetheless, the Capriccio sinfonico plays an important role in Puccini’s oeuvre, not only as a source of motives for the operas which followed (for example, the beginning of the fast middle section of Capriccio sinfonico appears almost note-for-note as the instrumental beginning of La Bohème), but also due to the fact that it is his first extensive composition which displays that very specific "Puccini sound" in which he attempted to combine the tradition of Italian bel canto style with Wagner’s treatment of motivic material and handling of the orchestra. This is the first critical edition of the work, included in vol. 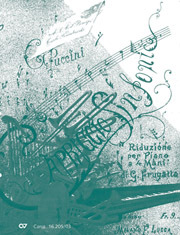 II/1 of the Edizione Nazionale delle Opere di Giacomo Puccini ("Composizioni per orchestra").